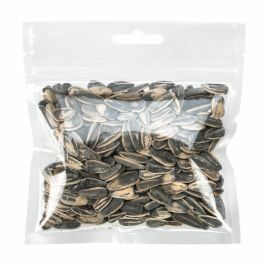 Hanging barrier zipper bags make an attractive retail display for scented and flavored snack items. This HZB4S bag has a usable space of 3 5/8" x 5" and features a clear front and silver metallized back panel. Features include strong side seams, pre-opened zippers for easy filling, a 1/4" peg size hole for hanging, and convenient tear notches. 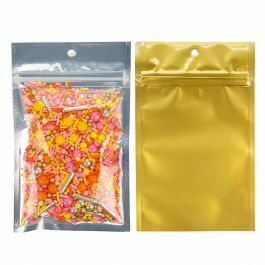 Our line of hanging zipper barrier bags are formulated to keep scented and aromatic products fresh. The HZB4S bag features a clear front panel to showcase your product, while the silver metallized back provides space for branding. 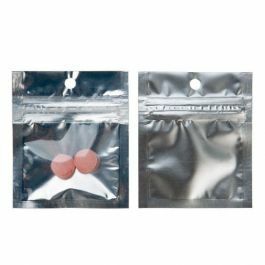 This bag is constructed with high barrier protection, thick 4.0 mil material, and a strong zip closure to prevent air flow. 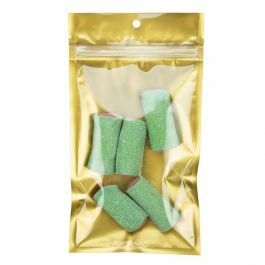 This 3 5/8" x 5" bag is useful for packaging items like chips, candy, herbal teas, sea salts, and spices. 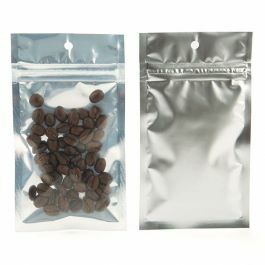 For easy filling and sealing, this bag comes with pre-opened zippers and is heat sealable for a secure closure. Features include easy tear notches, strong side seams, and 1/4" round peg hole ready for your retail display. Inner Dimensions: 3 5/8" x 5"